If you have a large family with an ample amount of laundry to do each week, there’s a good chance that you have an appreciation for your all-in-one washer and dryer. Models from LG, for instance, have nine different wash cycles for the utmost convenience. However, every washer and dryer needs maintenance in order to stay intact over time. Not sure how to keep your appliance in shape? 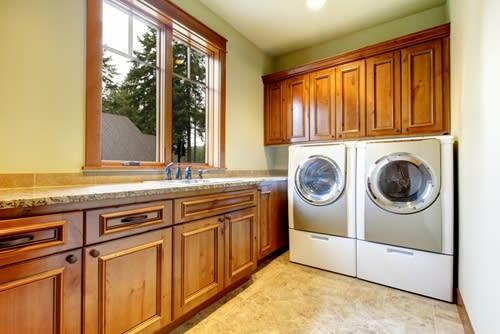 Here are some key tips to take into account whether you have an all-in-one appliance or separate washers and dryers. As House Logic noted, it’s critical to remove the lint from the filter before each drying session. This can improve the efficiency of dryer itself, cut drying time in half and reduce the potential for a fire. This is a task that many people don’t do, but cleaning your lint trap can remove unnecessary chemicals from the filter that might have become trapped. Simply use a bit of detergent and warm water to remove all debris from your trap before its next use. The ventilation pipe that streams out of your dryer should be cleaned out at least once a year to improve efficiency and extend the lifespan of your dryer, according to Repair Clinic. Remove the pipe if necessary to get inside and eliminate all of the dust and lint that has piled up. Be sure to use the proper load setting and amount of detergent for each round of laundry to ensure that your washer isn’t working harder than necessary. This can also cut down on water waste over time, reducing your carbon footprint.